TORONTO - Drake fans in Toronto will soon have a new spot in "the 6ix" to hit for possible sightings of the hip hop superstar and his famous pals. A publicist for the rapper's new restaurant and bar, Pick 6ix Restaurant, says the venue is preparing for a grand opening, although the date has not yet been set. 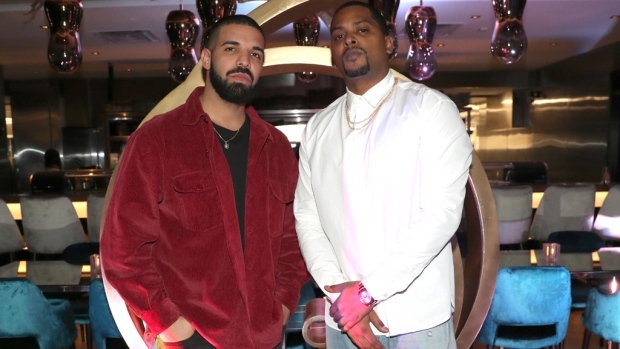 The new eatery -- adorned in black and gold, according to promotional photos of the birthday bash -- joins Drake's other favourite restaurant hangout, Fring's, owned by his business partner Angelo Ferraro and the family of celebrity chef Susur Lee. Pick 6ix is located on the southern stretch of tourist-friendly Yonge Street, steps from Union Station, the financial district and the Air Canada Centre, home to the Raptors.